The USDA food pyramid is designed to offer the best possible nutritional advice to the average American (and by extension, the average western person) but it doesn’t always work perfectly for those with special dietary needs, health issues or allergies. There are several specialised pyramids for common health problems but there isn’t currently one for those who have nut allergies. The clinical definition of a food allergy is ‘an exaggerated immune response to a food’ and this can range from mild to life-threatening. The reaction to food can vary from physical, which is the most common through to mental and emotional symptoms and from immediate and acute manifestations (breathing difficulties, rashes, convulsions etc) through to chronic and hidden symptoms such as the stomach problems created by gluten intolerance. In any case, once a food allergy is identified, substitution or avoidance become necessary to maintain optimum health and all these can be issues for those trying to adapt healthy eating patterns and working with standard tools such as the food pyramid. Some of the foods that we eat most regularly are also common allergens – the highest allergy rates occur with gluten milk, cheese, nuts eggs, seafood, tomato, strawberries, citrus fruits, strawberry and chocolate. As nuts are a common allergen, it’s important to recognise the relative dangers of different kinds of nuts – the ones most likely to trigger allergic reactions are hazelnuts, walnuts, cashew and almonds. Many people find that they have allergic reactions to these nuts but can still eat chestnuts and coconuts, but examining the relative risk levels of nuts in the diet is a step that should only be taken under the guidance of a doctor or dietician. 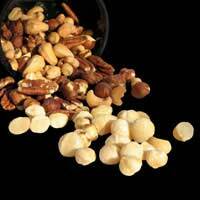 Avoidance is a complex issue, especially when the allergy is to nuts, as so many foods contain trace elements of nuts through cross-contamination. If one person in a household has a nut allergy this can lead to them being excluded from many ‘family foods’ and often results in them feeling isolated. Alternatively some families choose to all go nut-free in the house so that all foods are equally available for everybody to eat. Substitution is a simpler matter once people become adults – for children avoidance is really the only option as it’s just too complicated for them, or their carers, to assess if a food is nut free or not. Snacks that can be substituted for nuts included pumpkin or sunflower seeds, roasted in the oven with a little salt and some curry powder or herbs to add to the salty, crunchy flavour. Sunflower seeds can also be lightly roasted ‘dry’ i.e. in a pan without any oil or seasoning until they become slightly brown, and then ground up to make a substitute for pine nuts in pesto. Nut butters sometimes provoke allergic responses – peanuts are not actually a nut but many people are allergic to peanuts anyway. Tahini is a blend of ground sesame seeds and sesame oil that many people find they can use in place of peanut butter and there is a soy butter which can be used in sandwiches although some people find they develop an allergic reaction to soy in the longer term. When baking, consider substituting rolled oats which have been lightly toasted in the oven for chopped nuts in any recipe. Oats are a fantastic nut substitute because they have high levels of soluble fibre so they provide a similar level of nutritional input to that given by nuts in food pyramids. You can also use crisped rice (breakfast cereal variety) to bulk out biscuit and muffin recipes. But for cakes you can’t really use oats as they dry the recipe or crisped rice which often becomes soggy in the baking. Many people find they can tolerate grated carrot or apple as a substitute for nuts in many cake recipes and if that turns out to be the case, consider using some other unusual ingredients such as grated parsnip, courgette or even beetroot, all of which add a sweet and moist texture to cakes and muffins. In savoury recipes, lentils can often be substituted for nuts, and the small red or green lentils don’t need soaking before cooking so they can easily be used as a substitute ingredient without too much forward planning. Lentils also provide good levels of fibre so in food pyramid terms they are a good substitute for nuts.